The Chaffinch (Fringilla coelebs, as named by Linnaeus in 1758) is a small graceful bird who is quite common in many parts of Europe. As well as Europe, its habitat includes North Africa western Asia and the Canary Islands, where they live in each case in forests, gardens and parks. In addition some live in mountains up to approximately 1,500 meters high. Their body length is around 14 to 18 centimeters, and they weigh a delicate 20 grammes approximately. The male has a bluish gray upper head and neck. The lower parts are brownish-red. The female is characterized by a more greenish brown colour. Both have two remarkable white wing bars and a greenish rump. They have a short, thick and conic beak. By using this small but strong beak they can easily release seeds from hard shells. As well as seeds of all kinds, the food of the Chaffinch also consists of berries, fruits and insects. Some courageous Chaffinches can be fed in presence of humans with fine breadcrumbs or seeds. Chaffinches run on the ground with a rhythmical head-nodding. Their flight is an up and down wavelike undulating motion. In the spring the male starts loud singing to mark its breeding area, and can be heard to sing his song from February to September. The song itself lasts a maximum 5 seconds, and can easily be repeated 10 times in a minute. A Chaffinch generally sings 2 or 3 different songs in several versions, and in different areas of the world, regional dialects of different calls can be heard. The song is learned from the father or other chaffinches, but in places where other finch species, for example canaries, are also found the chaffinch can copy the call of a canary or other finch as part of its repertoire. The thick-walled Chaffinch's nest is carefully constructed from includes roots, fibers, mosses, and lichens. Inside it is equipped with hair and individual feathers. The nest is built usually at a height of two to ten meters on bushes or high in the trees in a forked branch, and is well camouflaged by the moss and lichen construction materials. The female Chaffinch breeds once or twice during a year and lays four to six light brown or bluish-white eggs, which can be colored quite differently from nest to nest. They always however have red to dark-brown marks. If she senses danger the female ducks herself deep down into the base of the nest. The incubation period amounts to thirteen to fourteen days. After hatching the chicks are fed with insects and larvae by both parents. About fourteen days after they first hatched the young birds leave the nest. 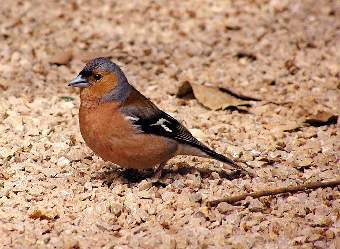 The coelebs part of the Chaffinch's latin species' name (Fringilla coelebs), means, in Latin, single person (caelebs). It was chosen by Carl von Linnaeus (1707-1778) because, in Sweden, only the females and the young birds migrate in winter while the males remain in their home area, leading a celibate existence until the Springtime.